Fixes a bug which made it necessary to visit the MCM menu twice in order for the protections to update. Fixes a bug which was causing the protections to be either 100% damage reduction or nothing at all. 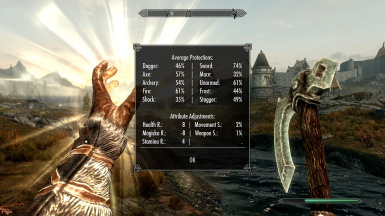 - The realistic preset was changed so that metal armors are not as susceptible to shock magic anymore, due to it acting essentially like a lightning arrester (offering the electric current an easier path than through the body). Very small update which fixes two minor oversights of 2.4.1. 2.4.1 is a major update with a wealth of new features and improvements. Due to the new options in the MCM menu loading a settings file created with 2.3.5 or earlier will complain about missing values in the file. All of these missing values will be set to 0 and must be adjusted by hand afterwards. The missing values are mostly on the first few pages ("General Settings", "Advanced Settings", "Baseline Adjustments"), but there is also the new poison protection (for each armor type) and the new spell section ("Blocking & Spells"). 2.3.5 includes a fix for some magic based effects which would erroneously trigger sound effects, a much improved and more helpful logging system and some improvements behind the scenes. - Much improved logging system which delivers much more useful information in general and runs silently alongside normal gameplay. The verbosity and therefore detail of the log can be adjusted in the MCM menu. - Some magic based effects which would erroneously trigger sound effects will not do so anymore. This was simply achieved by disabling sound effects when they were not triggered by an actor. 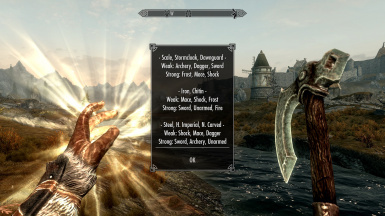 Meaning that actor based magic could potentially still trigger unwanted sound effects, though the vanilla spells seem to work fine as is. - Included a second safeguard to ensure that actors will never have two True Armor scripts attached to them at the same time. Two simultaneous scripts on an actor could lead to highly exaggerated attributes and that was the cause of the "Speedy Followers" bug that had been fixed for the most part in 2.2.5 already, but seemed to be still possible in very rare cases. This updates brings sound effects and a much better Health Limiter, in addition to some improvements behind the scenes. - Sound effect overlay. Striking an actor under the protection of True Armor will give audible feedback and tell you how effective the hit was. Only physical weapons are supported at the time, all of them bringing distinct sounds for deflects, pierces and full hits to the table. - The Health Limiter can now dynamically compute the estimated endurance and toughness of an actor to adjust the limit accordingly. No more compromises needed, no more ridiculously weak bears, giants, mammoths and dragons. And even better: it works with any actor, official or custom. - The Health Limiter can now also distinguish between enemy, neutral and allied NPCs, allowing you to set its strength independently for those. Due to the new options in the MCM menu loading a settings file created with 2.3.3, or earlier versions of the mod, will complain that these options could not be found. This is normal. You will have to fill in the missing values by hand after loading. All of them are on the General Settings page: Audio Volume sliders and Health Limiter sliders. The logging functionality now stops itself when loading a game or exiting the game. Apparently the nexus won't properly upload a new file unless it comes with it's own version number. So here is the fix that makes 2.3.1 work without having to start a new game for it. Major Update with many improvements, focusing on better usability. - Added coverage settings for the different armors that can be set for each area (head, body, ...) individually. This can be used to account for gaps and weakspots in the armors and influences the chances to deflect or pierce hits directly. 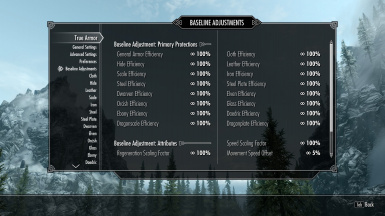 This update will break backwards compatibility of custom settings created with 2.2.5 and previous versions a bit! Fixed the "Speedy Followers" bug, which caused followers attributes to escalate. Added a logging function to True Armor for future debug purposes. 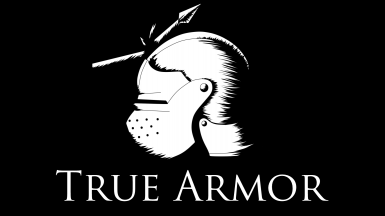 File 'True Armor . 2.4.3' changed to 'True Armor - 2.4.3'.